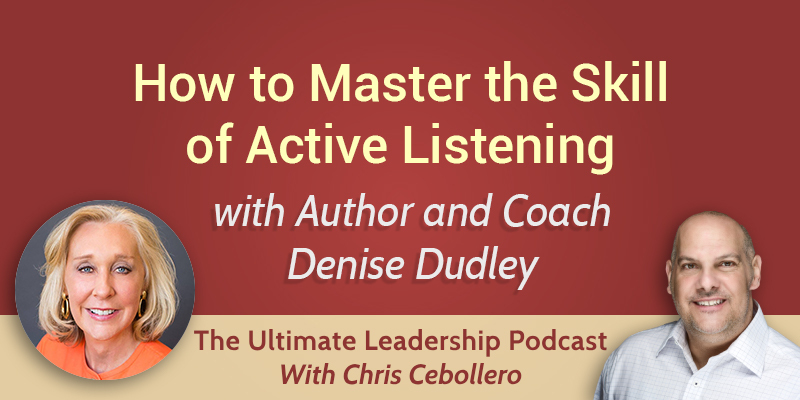 My guest today is author and coach Denise Dudley, here to share with us her expertise on the art of active listening. It’s important that we all become aware of the fact that by fully listening to what someone has to say we honor that person. Active listening sounds like a tough job, but once we commit to it, we will almost instantly improve our relationships on a noticeable scale. Listening seems to us like a very passive activity. Research has shown that when you’re truly listening, many parts of your brain lighten up. There is a lot going on, but physically it feels like we’re just sitting there. Part of your job as a speaker is to always be listening and watching for feedback in your listener(s). Watch for cues to make sure your listeners are still with you and they haven’t become bored. If you are going to really listen to someone, go to a quieter, neutral room. Make sure you also avoid distractions. We try to have our most important conversations in person, because we get to have these visual cues. The first step in any journey towards becoming better at whatever it is you’re interested in is to actually make a commitment. Sometimes people may have different views. It’s hard to suspend your immediate judgment, but it’s really important to do it if you really want to listen to what that person is saying. Suspending your immediate judgment has to do with listening without formulating a response just yet and staying open enough. It’s important to make a commitment not to interrupt. Wait because people need to feel that they are heard. Only interrupt someone if they’re being offensive or abusive. Paraphrasing is really the best first thing that you can say once you’ve been listening to a segment of someone’s story. When you hit it right, you see the other person lighten up. If you hit it wrong, you get a red light. It’s also important to “listen” to nonverbal communication. Brains don’t really love to multitask. Many people actually resist multitasking. You are multitasking if you’re listening and considering what you’re going to say next. Wait until the person is finished and then formulate your response.